Do you ever just want to get away from the hustle and bustle of everyday life? Just put all your thoughts of work behind you for a day or two, or maybe for a week? Well, you can do just that at The Rock Ranch! 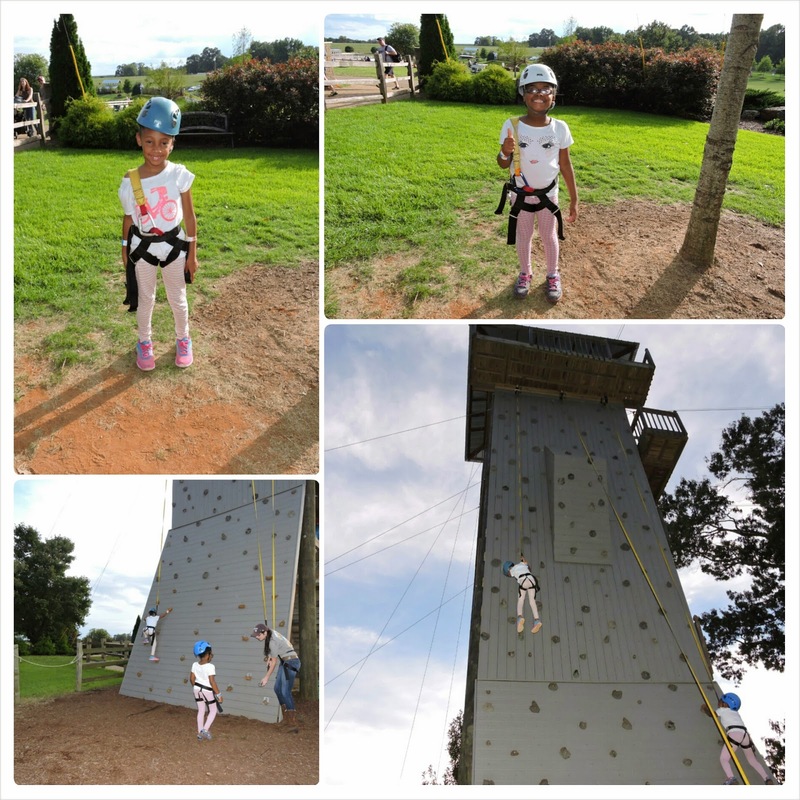 A place bringing families together to escape city life and enjoy peace and fun in the country. When I got the email invite to attend The Rock Ranch Blogger Media Event in The Rock Georgia, my thoughts were, "where the heck is The Rock?" I had to do a map quest to see how far it was from where I live. The Rock, GA is over 1 hour and 30 minute drive south from where I live and I was almost hesitant to make that drive. But seeing that it is owned by Chick-fil-A Founder S. Truett Cathy, I was willing to do the short road trip. I called Mr. M while going over the email invite to see what his thoughts were about the girls and I taking a trip to The Rock Ranch. He told me he has been seeing advertisement at Chick-fil-A restaurants about this ranch and also said we should go and he'll come along too. The Rock Ranch is a beautiful 1,500 acre cattle ranch located one hour from Atlanta or Columbus and 40 minutes from Macon in The Rock, Georgia. 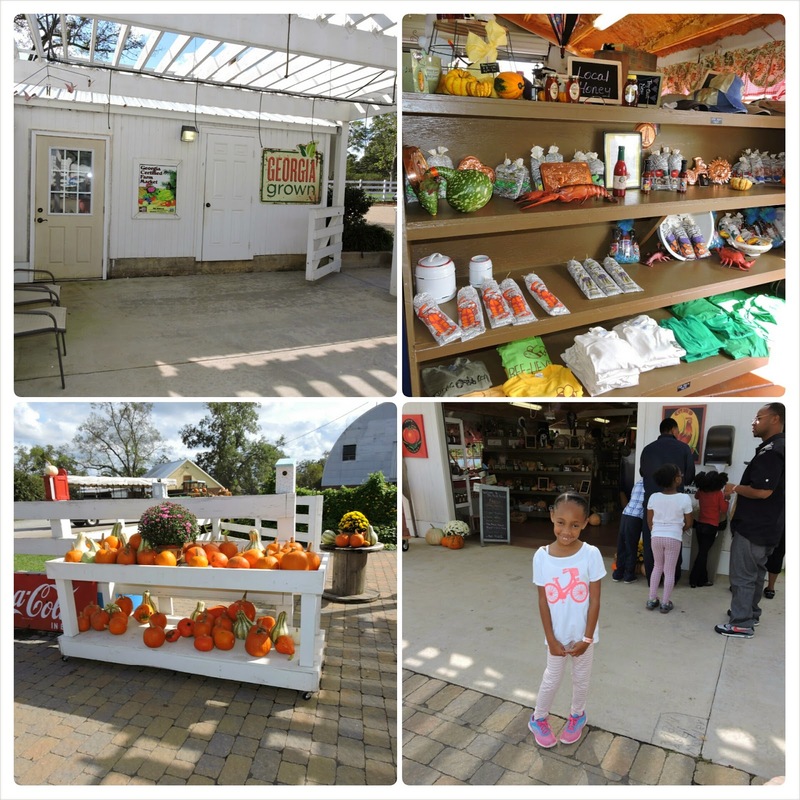 It's a place where families, school groups and even businesses can come to enjoy what they call "agritourism." 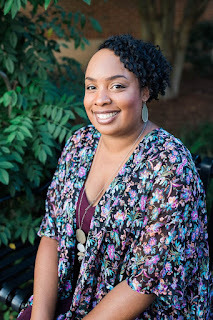 The Rock Ranch is dedicated to "Growing Healthy Families"! When I received my media kit in the mail, I was overwhelmed with all the great stuff this ranch had to offer. This is no ordinary ranch that only has cattle, horses, and hayrides. 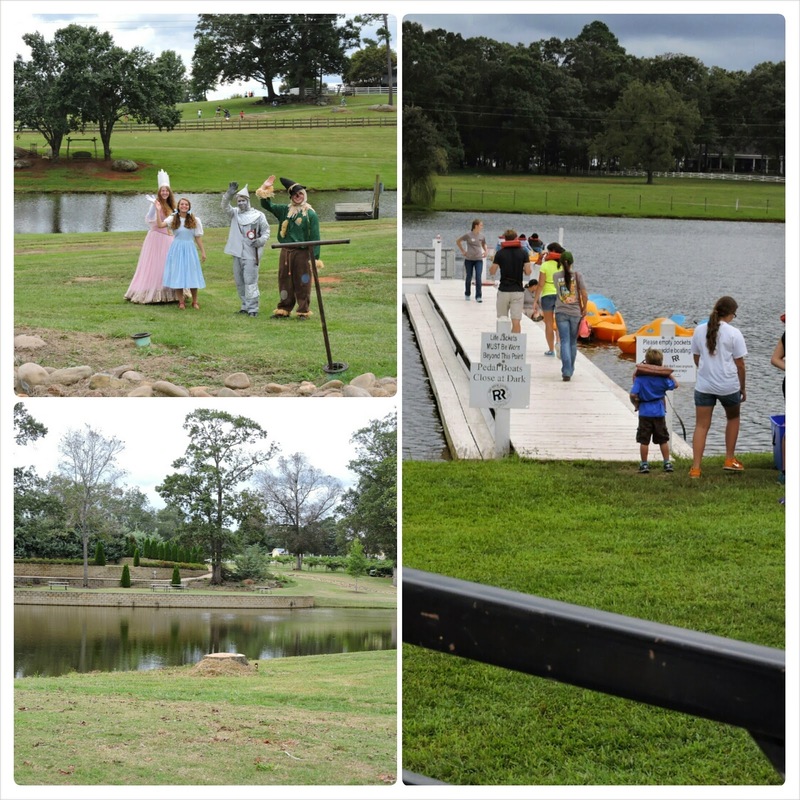 They have acres of fun outdoor activities to do for the whole family like zip lining, hay rides, pony rides, Tiny Town (a village of themed playhouses), a locomotive train, a petting zoo, paddle boats, pumpkin cannon, cane pole fishing, carousel, live bands, corn maze, and so much more! The family and I was too excited to hit the road to The Rock Ranch! Since Mr. M works for himself, he doesn't take many weekend trips with us since it's his busiest working days, so it was great to have a family day with us all together. When we gotten close to the ranch, both Mr. M and I did not have cell phone signal- nooooooo! But you know what? I'm glad we didn't because the purpose of this trip was about bringing families together and not focusing on the outside world. We've grown so attach to our electronics and checking it every minute for emails, texts, and social media updates, that we just don't relax and enjoy ourselves uninterrupted. Once we arrived to The Rock Ranch, we were at awe at how huge and beautiful the land was. Rolling hills, great picture prefect landscape views, and seeing families creating wonderful memories together. The theme of the ranch that day was "Hats off to Heroes", so there were police officers, firefighters, and paramedics there. Our first stop at the ranch, we went into Truett's Barn to meet some of the staff members and learn a bit more about The Rock Ranch. While there, we also were treated to a yummy lunch, met up with some of my local blogging buddies, and snapped pictures with the Wizard of Oz crew (this year the ranch is celebrating 75 years of Wizard of Oz). After the meet and greet, we all hopped on the tractor trolly wagon to tour the whole ranch. 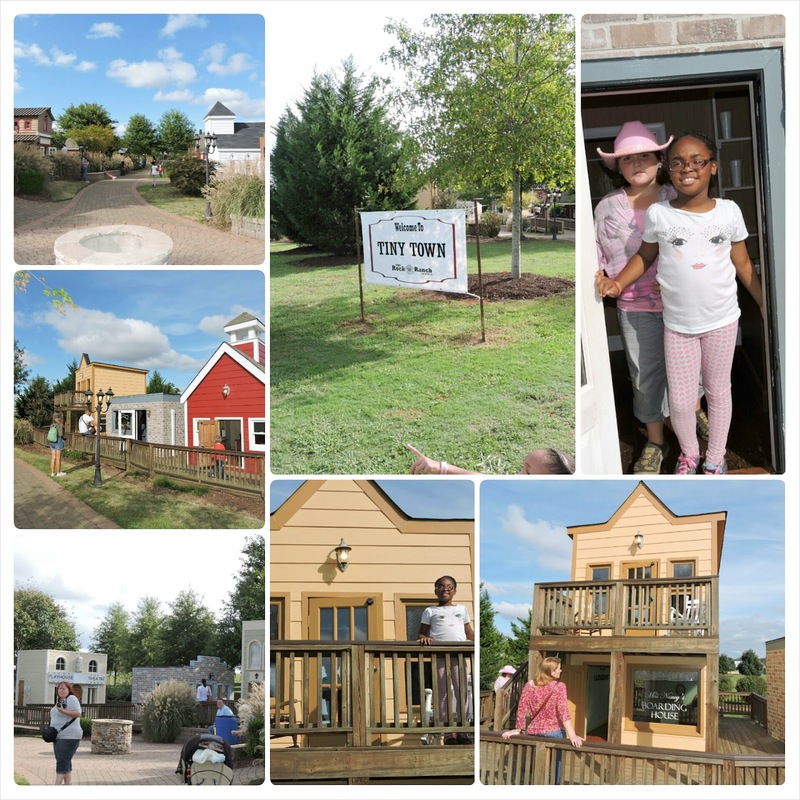 While on our tour, we learned about The Rock Ranch's Farm Stay, which is 3 and 4 bedroom homes that families can rent for $250 a night. These beautiful homes were like a home away from home, not anything like the cabins you see in state parks. 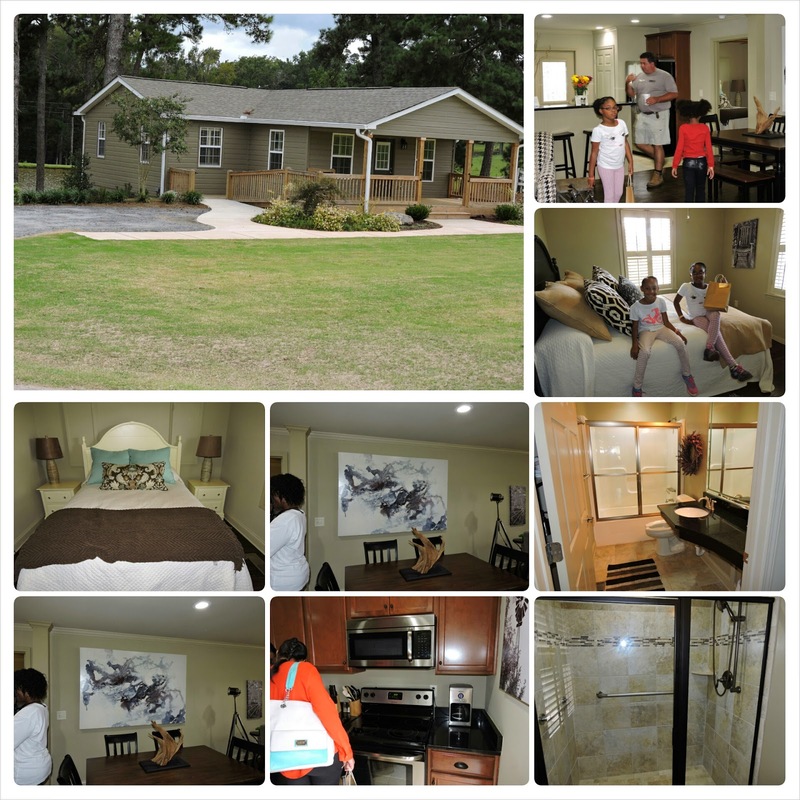 The houses had a living room, fully equipped kitchen, walk in showers, full size bedrooms, and every room is fully furnished. I loved stepping out on the deck to a peaceful lake- I surely can see myself renting a house there for a few nights for a escape. And that's not all you can rent! Remember the game Oregon Trail? You can rent Conestoga Wagons just like the ones on that game to sit around the camp fire and have a great outdoor camping experience. 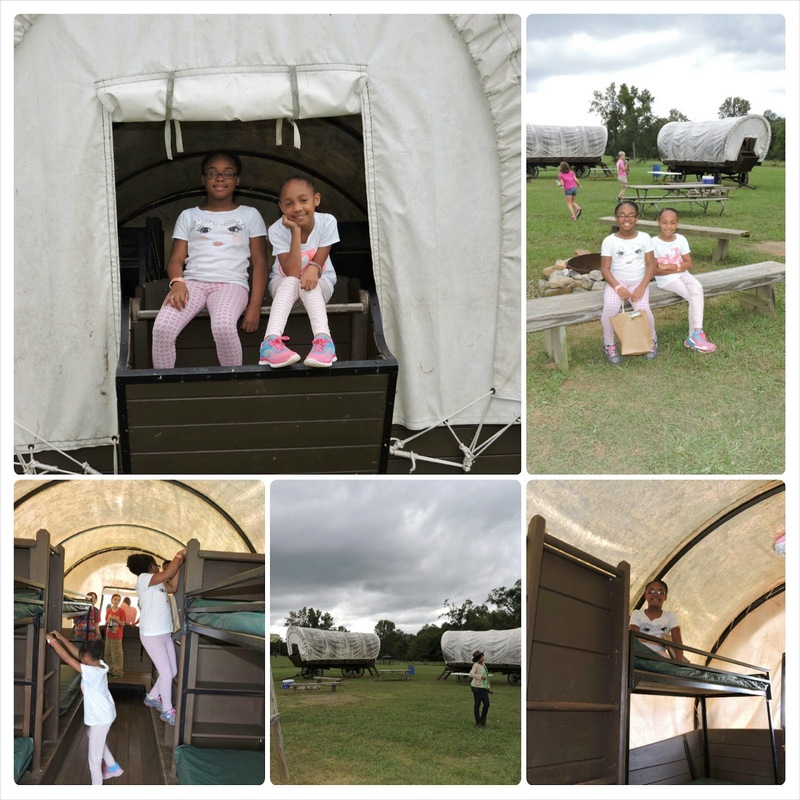 Inside the Conestoga Wagons are 8 bunk beds, so your family can get a relaxing night rest and gaze at the country night sky- much better than sleeping in a tent. To rent the wagons it is $225 a night. Once we got to the end of our tour, my family and I, and a few blogger families headed to the Farm Market. At the Farm Market you can purchase fresh homemade strawberry ice cream, fruit preserves, local made honey, fresh beef and pork, and local produce. I love going to farm's markets and supporting local farmers. This is the best, healthier way to get your food. After walking around the Farm's Market and picking up a few items, we went where all the attractions were. Gosh, there was so much to do but so little time! We tried to do everything that the ranch had but we missed out doing a lot of things like riding the carousel, riding the train, doing the pony rides, getting lost in the corn maze, and other stuff. My advice is if you attend the ranch you need to go early so you can have a chance to do everything. They also have different concessions to choose from, even burgers! Yes, burgers, even though Chick-fil-A is known for chicken- and there is chicken for you to eat there too! The highlight of our visit was zip lining! My family, except for me since I'm scared of heights, enjoyed zip lining across the corn maze and lake. From what they told me it was a smooth ride across the sky. If you're looking for a escape from city life, a nice little getaway, a retreat, The Rock Ranch is the place to be! It is well worth the drive! You can also have field trips and celebrate you or your child's birthday there. I want to give thanks to The Rock Ranch crew for inviting my family to have a fabulous day on their ranch! It was great to learn about this hidden wholesome countryside charm! It has been a pleasure! 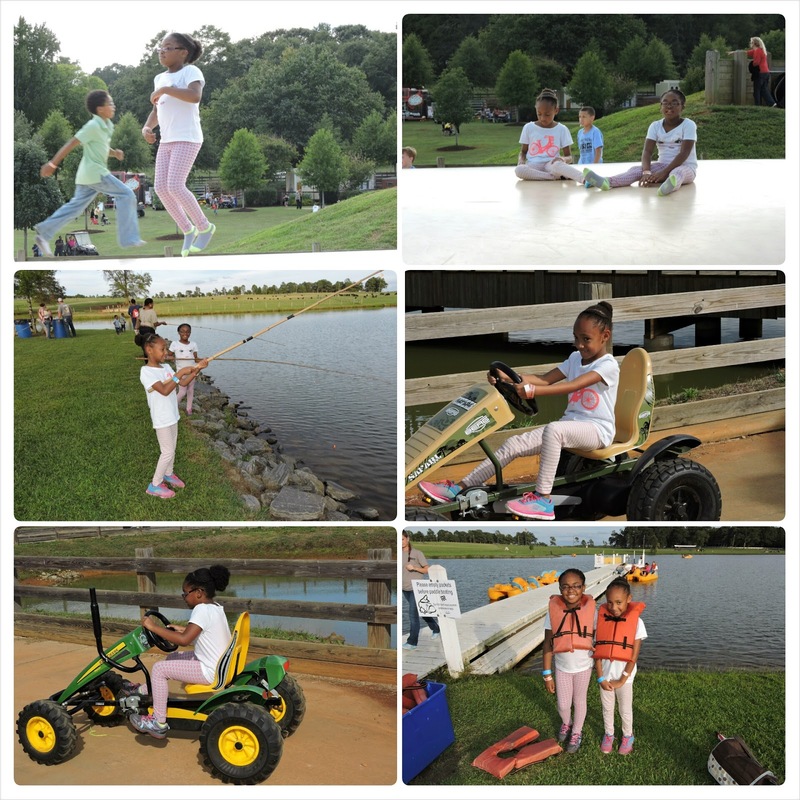 The Rock Ranch is open each Saturday beginning Sept. 27th to Nov. 15th, from 10 am- 8 pm. Admission is $15. Children three and under are free. Season passes can also be purchased for $39.50. For more information like prices of some of the attractions please visit www.therockranch.com/admission. Also, make sure to text "Rock" to 81680 to get cool prizes, discount codes, and info. Do you visit a ranch or farm in your local area? I can't wait to go on Saturday I will miss my cell but it doesn't even work in my house so I am good to go lol. I now what to expect and I can't wait to have fun....but I am not doing the zip lining at all. You'll love it Kita! Go early if you can so you can get a chance to do everything. Wow! What an awesome place to visit! The Rock Ranch sounds like a wonderful family outing. I love Chick-fil-a, but I didn't know they had a ranch. I never knew Chick-fil-A had a ranch either. That is the best part about being a blogger, you get to learn about new things and places. I grew up in South GA, only an hour from Macon and I've never heard of The Rock, GA, either. Nor have I every heard of The Rock Ranch! What a great concept! Those wagons were off the chain too Alli! I was surprise how roomy it was inside them, way better than being cramped in a tent on a ground. 1) Looks like y'all had loads of fun. 3)Yes ma'am to that outfit. Especially the pants and boots. WERK! Thanks Aleshea! I couldn't wait to bust out with my Fall boots and this event was the prefect time to dust them off and wear them. I'm sad we missed it. I had a wedding to attend. Looks like you all had a great time. My husband is like Mr. M and getting away on the weekend with him is a rarity so I get how great that must've been to have everybody out and about. Sorry you had to miss the event. See if you can go this coming Saturday Mimi since the ranch is having another blogger media event. 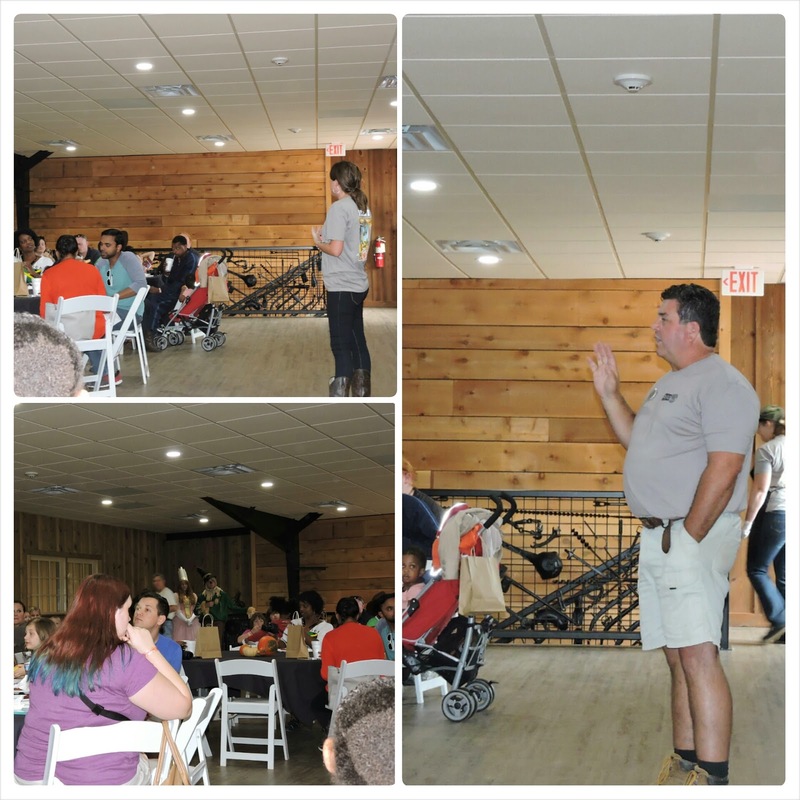 It was great having Mr. M come join us, he has tagged along to a couple of blogger events so far but this one was extra special since the ranch focus was bringing families together. This makes me wish I lived in Georgia again. I loved seeing how much fun y'all had. Georgia sure does has a lot of fun places to go to! I remember doing this as a rite of passage into autumn with my grandmother and sons. Great shots, are these with the new camera, if so, what were your settings? Yes all photos on here is from my new camera. I have the setting on Auto since I haven't really played around with the other settings yet. We had such a great time!!!!!!!!!!!!!!!!!!!! Oh I wish we could have gone! It looks like so much fun! I love the idea of the cabins! I might have to rent one too! Pookah would love going to this ranch Lashawn, you should take him! It was nice seeing you and your family at the Rock Ranch. You're right about getting there early to enjoy all the attractions. We missed out on some things, too. It was great seeing you and the family as well Candy! The Rock Ranch is a very huge place with a lot of attractions! Thanks Stacie! Those rooms were great! That's are motto...."on the go". Hehe! Yeah girl, this was something I needed to put down my cell phone and actually enjoy without interruptions. Even after I left I still really wasn't checking my phone. We went once several years ago as part of a homeschool group but didn't have time to do nearly the things that you did! I've always wanted to come back some time to really explore. Great pictures! Thanks Amy! The Rock Ranch is HUGE! You need to go back some day so you can try to do everything.